Focus Books Chosen Because . . . 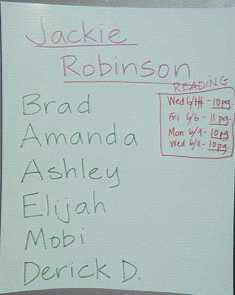 I help students divide up the number of pages in the book by the number of days theyíll have to read. This often takes a few mini-lessons: "How many days do we have available for reading? How many pages in your book?" "If you divide the number of pages by the number of days, how many pages will you need to read each time?" "What makes a logical stopping place (help students see that sometimes they may need to read more or fewer pages to fit chapter ends or logical pauses in the book)?" 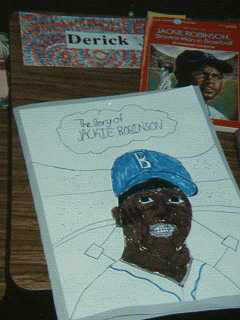 Literacy Block -- 9:30 - 10:45 a.m.
response & extension project (culminating) show understanding of book, theme, characters, etc. Folders for students to keep journal entries, pocket for focus lesson work, "Golden Lines," self-evaluation sheets, project plans. 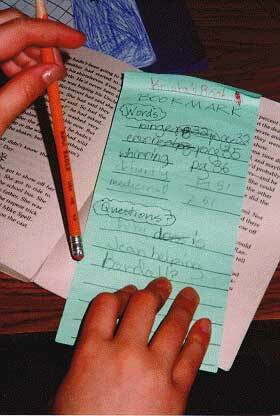 Bookmarks to identify books and keep notes as students read. 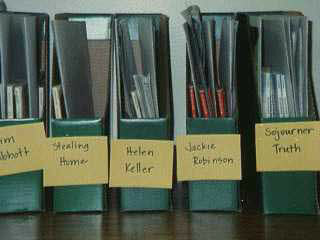 Boxes for book sets and folders for each group. Cereal or pre-fab boxes work fine. 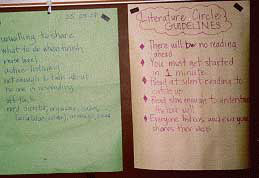 GuidelinesDecide as a class how they will prepare for literature circle meetings, when and how reading can be made up, what makes a discussion run smoothly. Click here for more information on helping students develop discussion guidelines. Group listsA chart showing who is in which group and what pages they have decided to read. 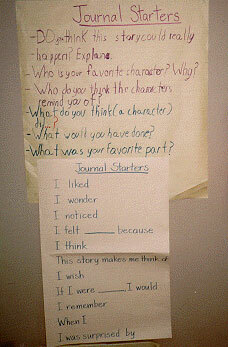 Journal promptsKeep a running list of ideas for ways to start and what to include. Click here for ideas on using prompts in discussion; click here for ideas on using prompts in written response.